Make your own bespoke gift with the Gin & Nibbles Gift Hamper. 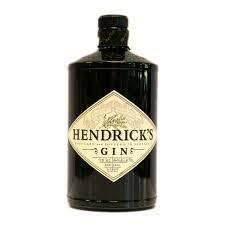 Choose the perfect gin to accompany three delicious nibbles of your choice. Definitely a gift to be appreciated. The Gin & Nibbles Gift Hamper allows you to make this gift bespoke gin gift for your recipient. 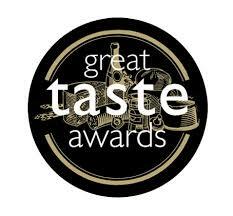 Choose you favourite Gin to accompany three delicious hand picked nibbles from our Award Winning range. Presented in a black lidded box finished with a hand tied red ribbon and personalised gift message. 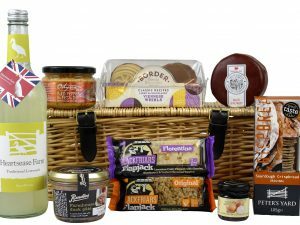 If you have a favourite brand that is not featured in our selection, please email us at info@handmade-hamper.co.uk to see if we can obtain it for you. Our current policy is to deliver directly to the recipient to obtain a signature upon receipt. If the recipient is not home they will attempt to deliver to a neighbour. If you would like the gift leaving in a safe location or with a particular neighbour, please advise us in the delivery notes upon checkout. Yes, you can choose your preferred delivery date from our calendar during checkout. However please note this is not a guaranteed service and delays can occasionally occur beyond our control. Deliveries to Scotland (Highlands & remote areas), Ireland (Northern & Republic) and all UK Islands will take longer to arrive. Please allow an extra 1-2 days. Yes, we are able to offer Saturday delivery at a cost of £17.95. This is an all day service and specific AM/PM slots cannot be requested. Unfortunately we are unable to offer you a Saturday service to all locations (eg Scottish Highlands) If in doubt please contact us at info@handmade-hamper.co.uk to check. Enriched with vitamin E, the Sensual Skin Gift Box is full of wonderful benefits for the skin. Known for its anti-ageing, hydrating and skin refining properties, vitamin E is an invaluable extract, providing optimum hydration and a sense of well being. Add a bottle and chocolates to make this the perfect luxury gift. The Cheese and Prosecco/Champagne Gift Hamper will be the perfect gift of your own creation. 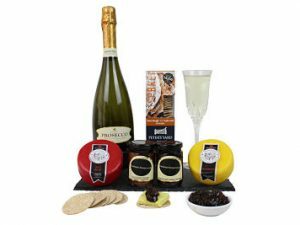 From our superb Award Winning range, choose your favourite cheese, chutney’s and fine Prosecco’s or Champagne’s to make the perfect present. A delightful gift for any occasion. The Breakfast Gift Basket is filled full of delicious bakery products to accompanying the Award Winning preserves and tea. Freshly ground coffee and pure squeezed orange juice make this the perfect way to start the day. Add a bottle of fizz to make this a superb breakfast treat.